The Buddha image on Bahiravakande, over looking Kandy town. OF pristine virgin beauty and palm-fringed golden beaches, Sri Lanka is an ideal getaway, more so if the simplicity of the people and the magic of the place matter to you in equal measure. Sharp-witted, the Sri Lankans have a warmth and ingenuity that is palpable as is their openness to life. Though water sports and beaches have not been developed to their potential—the over 19-year-old ethnic strife has apparently taken a toll on tourism—the government was promoting the Island nation in a big way with the crucial ceasefire between the LTTE and the State in place. However, now that the Tigers have suspended the peace talks, the development programmes will have to be put on hold yet again. Geographically, Sri Lanka is rather small—405 km wide—but it has to its credit seven world heritage sites. These are the sacred city of Anuradhapura, medieval city of Polonnaruwa, cave temples of Dambulla, Sigiriya Rock Fortress, royal city of Kandy, Dutch Fort at Galle and Sinharaja Forest Reserve. Sigiriya, incidentally, has been declared the eighth wonder of the world. This spectacular 185-mete-high granite outcrop with landscaped gardens belonging to the 5th century, was built by King Kassapa after killing his father. Originally, it had close to about 500 Ajanta-style frescoes but now only 20 remain. A gravity-defying pool, measuring 27m by 21m, was excavated from the rock. 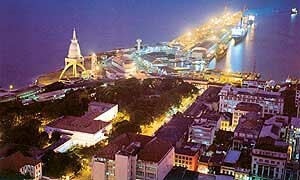 Colombo, with its wide range of saloons and MUVs, is a delight for car freaks. Since Sri Lanka doesn’t have a manufacturing base for vehicles, these are imported from Japan. Reconditioned cars are a hot favourite with the locals and most of the lorries are either Nissan or Renault. Interestingly, though autorickshaws, or tuk-tuk in local parlance, have been imported from India, there is a move to phase them out. The capital is cosmopolitan and has some very swanky discotheques and night clubs, besides having a good share of five-star hotels like Taj Samudra, Lanka Oberoi, Hilton and Mount Lavania. The Indian rupee is strong in Sri Lanka and is valued at Rs 1.80. Trincomalee, about 257 km east of Colombo, is the fifth-largest natural harbour in the world. It is a Tamil-dominated area and at one point had some of the best beach resorts. Sadly, most of the resorts and homes were bombed during the peak of the conflict, forcing the once-affluent locals to take refuge in houses of those who had either fled or had been displaced. The Rotary Foundation has since funded a housing project in the war-ravaged area. Bentota, 65 km of Colombo, is known for its lagoon but except for water scooters and boat rides, it offers little else. At 2243 metres, Adam’s Peak is the highest summit in Sri Lanka and perhaps the most venerated mountain in the world. Described as a "natural cathedral so stupendous and exquisite that none can stand upon it without worship in his soul," it is held sacred by Buddhists as also by other faiths. The Buddhists believe that Lord Buddha left his footprints (Sri Pada) on a rock at the summit on one of his three visits to the Island. The western name derives from Pico de Adam, a term used by the Portuguese and reflects the Muslim belief that Adam landed on this peak when he was banished from Paradise. The Hindu belief is that the footprint is that of Lord Shiva while Christians believe it was left by St Thomas, one of the apostles of Jesus. Another place of religious significance is the Temple of the Tooth which is the Mecca for Buddhists. It is a repository of a tooth relic of Lord Buddha and is reported to have been brought from Kalinga to Kandy in 1590. Parts of the temple were damaged in a bomb attack by the LTTE in 1998. Sri Lanka abounds in Buddha statues. Dambulla, largest of Sri Lanka’s cave temples, is a world heritage site. 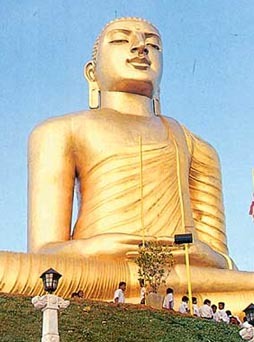 It is home to nearly 48 statues, mostly of Lord Buddha, including a 480ft recumbent statue carved out of a rock. For the anglers, the cool cool confines of Nuwara Eliya, a splendid hill country with tea gardens located at a height of 1889 m above sea level, is the place to be. It lies at the foot of Mount Pedro and is popular for its trout-filled streams as is for its 18-hole golf course, ranked among the best in South Asia. Fish that sing! This feature is unique to the Batticaloa lagoon where the fish can be heard "singing," particularly when the moon is full. There are several unconfirmed theories regarding the musical sounds that seem to arise from the depths of the sea. Famous for its tea and gems the world over, Sri Lanka also produces quality spices. Spice gardens can be found across the country, the best being in Galle in the south. It is a treat to see clusters of spices growing in abundance. Stilt-fishing is unique to the region where fishermen perch on horizontal sticks fixed to poles erected on the seabed and wait for hours sometimes to get a haul of fish. In Island Ceylon Arthur C. Clarke, who made Sri Lanka his home, had written: "It may well be that each of Ceylon’s attractions is surpassed somewhere on Earth; Cambodia may have more impressive ruins, Tahiti lovelier beaches, Bali ,ore beautiful landscapes (though I doubt it), Thailand more charming people (ditto). But I find it hard to believe that there is any country which scores so highly in all departments." There can be no better tribute to the untapped beauty of this "pearl of the Indian Ocean" and its gracious people; truly, a "land like no other." CEYLON was the first of the British colonies outside Australia, Canada and New Zealand to have universal adult suffrage. Education has been free till the university level since 1945. It is mandatory to attend school until 14 years of age. Sinhala, with Sanskrit derivatives, is the medium of instruction. At 92 per cent, Sri Landa’s literacy rate is the best in South Asia. The title and opening phrase of the national anthem were changed in 1961 on astrological advice. Mahinda, the monk son of King Ashoka, introduced Buddhism in Sri Lanka in the 3rd century BC by converting King Devanampiyatissa. 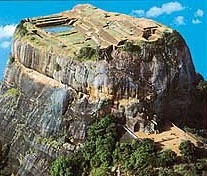 The hill where the conversion took place is called Mihintale or the "Hill of Mahinda." The popular religion is Buddhism. Hinayana or Theravada southern school of Buddhism is practice4d. Other countries that follow this form are Cambodia, Vietnam, Laos and Thailand. The world’s oldest historically documented tree Sri Maha Bodhisis is 23 centuries old. The sapling was sent by Emperor Ashoka in the 3rd century BC to Sri Lanka. Sri Lanka is famous for its high-quality gems, especially blue sapphires. Diamonds are not found in the island but raw diamonds are imported from South Africa for cutting and polishing and then re-imported. Vocalist Pt W.D. Amaradeva was awarded Padma Shri in 2002, a rare honour for a non-Indian. Kadwunu Poronduwa, the first feature film in Sinhala, was made in South India in 1948. Milk products, including curd, are not part of the diet. Other than restaurants, chilled water is hard to come by! "Temple Trees" is the official residence of the Prime Minister. It all started with the issue of language—whether Sinhala would be the only official language or Tamil as well. In the first discussions between the Tamil Federal Party (TFP) and the government of S.W.R.D. Bandaranaike in the 1950s, in the wake of protests against the decision to replace English by Sinhala as the official language, the TFP put forward other demands that were reflected in the bandaranaike-Chelvanayakam agreement of 1958. It was abandoned by the Prime Minister after Sinhalese nationalists piled pressure on him. From the pre-independence times, Tamils had a higher share in public service posts due to their proficiency in English. They also wanted a greater say in governance. As independence approached, the leader of the Tamils, G.G. Ponnambalam, couched the demand for it in the form of a request that half the seats in the legislature be given to the minorities, of which the Tamils were the largest component. Later, it was put in the form of a demand for regional autonomy for areas in the northern and eastern provinces. Another issue was land and the government’s policy of settling landless Sinhalese farmers under land development schemes in these provinces. The Tamils felt an attempt was being made to dilute their presence. The government position was that no part was exclusively for any ethnic group. The problem was aggravated by violence. 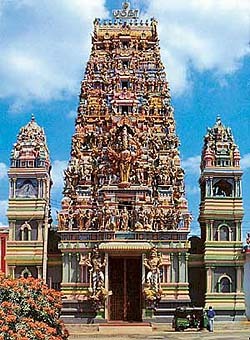 In the communal riots after 1956, the Tamils suffered the most. The riots of 1983 were the worst which led to the exodus of Tamils and the intensification of the LTTE campaign against the Sinhalese and the Muslims. The Sinhalese, like the Tamils, have originated from India but do not have a close ethnic or religious affinity to any particular group. Strangely, the conflict does not involve Indian Tamils who form 5.5 per cent of the population but Sri Lankan Tamils who comprise 12.7 per cent. Several efforts have been made to resolve the problem, beginning with the aborted Bandaranaike-chelvanayakam pact of 1958. The first peace talks were held under the Indian auspices in Thimpu in 1985. A ceasefire was declared in 2002 but talks have been temporarily suspended by the LTTE and the government has sounded high alert.